There will be new music later this week. 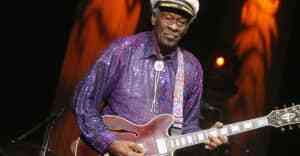 Following Chuck Berry's passing on Saturday, the legendary singer's family has confirmed via Facebook that his final album, CHUCK, will still be released. The album was announced last October on Berry's 90th birthday. In the statement, Berry's family wrote, "For months now plans have been in place, and preparations have been made with our friends at Dualtone Records, to reveal further details and music from the album this week. As a tribute to Chuck Berry, and with gratitude to his fans around the world, we will be following through on those plans in the coming days." You can read the full statement above. See what artists had to say about Berry's passing. Thumbnail image via Evening Standard/Getty Images.